I can't believe it! 1 more week of treatment left and I'm done. That's only 5 more trips to the Hospital! When something happens I always think 'Oh, I'll have to write about that in my blog' but once I actually get here I can't remember any of it! Things are still going ok, I'm feeling alright. I'm still eating everything the same (well...more of it) and swallowing doesn't hurt. I'm not getting my hopes up though because I know that the side effects can start from 2 weeks after treatment! It would be lovely to avoid them though (pleasepleasepleasepleaseplease) lol. My skin is quite sore and on Friday it finally cracked. It feels especially stiff in the morning and it looks like I've slept funny on it because it hurts to move it too much!! I am still using plenty of aqueous cream on it and have been given some gel to apply to the cracked parts. The stares I get when I go out are funny. I often wonder what people think because I know that before all of this it didn't register in my head that radiotherapy would mark the skin. I don't know what I'd think if I saw me walking down the street, lol. Hair update: It's getting there, slowly. It feels like it's taking forever and eve r to grow...I'm not even sure what colour it is. It's weird because some days it looks dark and then others it looks lighter. I took a (really bad quality) picture on my webcam and you can kind of see the length of it. Voice update: Nothing really to report on. People often lose their voices when they're having radiotherapy to the larynx (and I've lost mine already!) so I'm not expecting it to come back yet. Sometimes a little bit of voice comes out and I try to get it to come out more but it doesn't really happen. I think it's going to take a lot of time and effort to get back but I'm up for it! I had a couple of days where I felt ill this week, Thursday night (I think) I was sick once. I didn't feel sick before though, it just happened lol. But I did feel sick most of Friday and some of yesterday but I'm feeling much better now. I think that was just from chemo which I had on Wednesday. My last chemo is this Wednesday...I'm trying to imagine how it's going to be not having any treatment and I can't. It's a really weird feeling. Don't get me wrong, I can't wait for it to all be over!! But, it's definitely going to be strange just waiting that little while to find out if the cancer's gone. I think I'll have an appointment about 4 weeks after I finish treatment to have the lovely camera up my nose and down my throat to see if there's anything down there and then about 3 months after I finish I'll have a CT scan (or MRI?). Then from then on I'll have an appointment once a month for a year, then every 2 months in the 2nd year. etc etc etc until I get to 5 years and I'll be cured! I'll be coming up to 24 then...that's really weird to think about. I don't think there's anything else to update about to be honest. I'm unsure what to do about this blog once my treatment is over, because what will be the point in writing in it when I'm no longer kicking cancers arse? I would have kicked it already! I'll probably just update it after every monthly appointment to say 'Still cancer free!' or something. I'll still leave it open for people to see though because people might like to look back on it if they're going through the same thing...or because they're just interested! Thanks for the comments and emails, keep them coming. One last thing, I've put on even more weight. Boooooooooo. Hey Hayley - 1 week to go - WOW..
2 weeks for me. 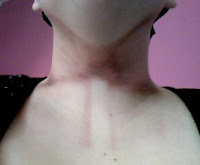 I can see you have the magic line on your throat, mines just starting to appear - no skin breakages yet but I'm sure its only a matter of time. I guess I shouldn't be jealous that you are still eating! lol I have still got my voice so my family are probably jealous too!!!! I can still moan about how much pain I'm in!! Keep up the good work, and keep up the blog - its inspirational stuff and great for you to look back on too. Well Brave Girlie,your on the home strech.For what its worth, I think that you should keep your blog going.You are such a inspiration to anyone who is fighting cancer,you have kept such a posative attitude,your sense of humour has been paramount in your fight.You are a credit to yourself and your family,enough of the soft stuff,go kick that arse as hard as you can for the last week. Hayley, so glad that the treatment is coming to an end for you. It has gone quickly. Please keep your blog going. You are such an inspiration to so many people with your strength of character. I've just found out that a friend of mine has stage 3 lung cancer and I'm gobsmacked! I think I need to refer him to your blog to steal some of your courage, if that's ok with you? Hi Hayley so sorry about not writing earlier, I didn't have net connection for past few weeks, just got it and logged on to see your progress, Its so good to know that your treatment is coming to an end and that it has worked really well.. you have endured everything with such courage and strength its a true inspiration to everyone, you have made your family proud of you, I wish you all the very Best and pray that you get cured of cancer real soon. You are going to kich cancer's arse Bigtime. Hi Hayley, I've just come here via Rosie (Freycob)'s blog. I am so glad you are nearing the end of your treatment. Mmmm methinks a new title 'Kicking life's arse' is is order - no? look, I can see you at tthe finish line!!!!! I still can't get over how amazingly strong you've been through all of this, you've kept your head up the whole time and I'm so happy that your okay. ..Just want to say I love you lots daughter! So proud of you! These seven weeks have passed quickly and will be over on friday! It's nearly five months since treatment started for you, these months too, have passed on by. ..You have endured much but NOT once ever complained. ..You have had crap days but have remained positive. ..you have found strength and given that strength to others..
..You have, and are, an inspiration to others. ..You have taken every day as a step closer to kicking this cancer's arse. I will finish off where i started..saying the same.. I LOVE YOU VERY MUCH AND I AM SO VERY PROUD OF YOU. YO! YAY FOR THE LAST CHEMO! hope you don't get any horrid side effects! I'll cross my fingers for you! Well done on your last day Hayley - was thinking about you on Friday. I've just been reading through your comments on this entry and now I really want you to have an end of chemo party you can invite me to ;D Hehe! On a more serious note I am SO thrilled that chemo is pretty much done. It's been one heck of a journey but one that you have faced with courage and humour, the best armour you could have had really :o) I know there's still a bit to go but remember that everyone single person who comments your blog is here for you to keep you occupied whilst you slowly recover and heal from the last few months. I don't know about you but it feels like such a whirlwind, from my perspective anyway...You've done great though girl and you are still the same old lovely Hayley, nothings changed in that respect! It'll only change if your hair starts turning blonde or red or something ;D Well come on, you need your ginger afro don't you?! Take care my love and text me if you need distracting!! It's Jason. I think you are so brave. But you know that already. Won't it be great though for this blog to gether dust eventually (which it will) - it will still float in cyberspace and get found by people doing searches and so may help them as it did me. Or keep it going. Whatever feels right. Mine is gathering dust because there is nothing really to say with all this DNA waiting. So I'm not. Nige - I don't know you but it seems to me that you are pretty brave too and on your way to kicking cancer's arse too. My family and all my friends would love it if I lost my voice. I can't imagine that. I am not making a joke something so serious - but I don't know how you do it - but you do - I'm a teacher, my students would probably love it. To all of you out there, keep fighting, keep being brave, keep inspiring and helping people by just doing what you do. 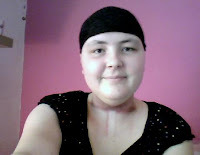 Hi Hayley just wanted to tell you that you are in my thougths and prayers,you are such a good strong girl. Can't tell you enough how much I admire your strength, you have great out look on life.My prayers are always with you.